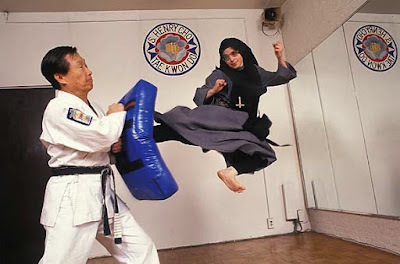 "In 1991, a group of French nuns arrived in New York to open a mission. All of them were from the Order of Fraternite Notre Dame. Not one spoke English. Their first plan was to establish a soup kitchen for the poorest of the poor. They chose a storefront in Spanish Harlem and started working. "Shortly after their arrival, they began to study the martial arts. Though they would never use the arts to hurt someone, a number of them have become quite good. Sister Mary, who is just over five feet tall, is the most serious." But what martial art do they study? The sign behind her head appears to read "tae kwon do." Evidence of Ghosts? You Decide! Looking for Tales of Adventure! What Happened to That Fungus?